Blue & White Spirit Seafire. 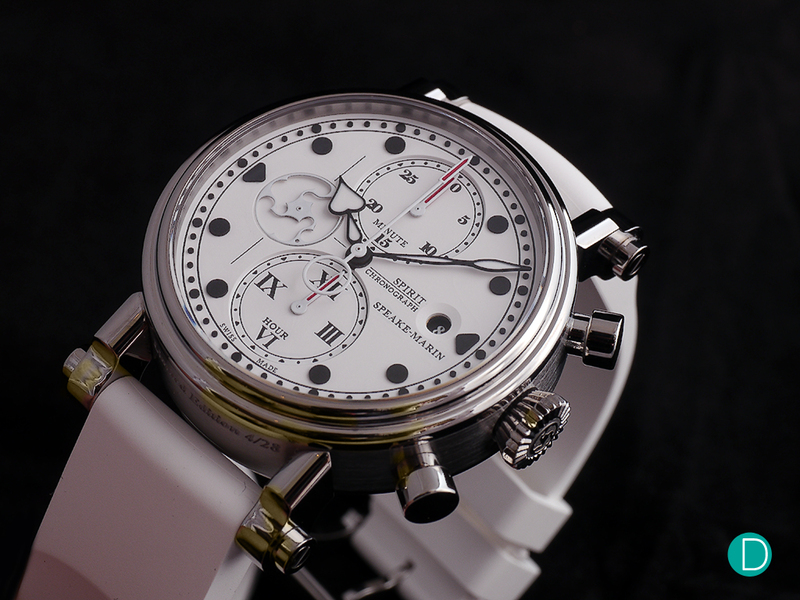 Chronograph, with a date indicator. A watch that features some rather interesting design cues, with a time-tested and proven movement. Dial might be cluttered for some, and that its overhanging lugs might not fit well for smaller wrists. A timepiece that is conversational, and one that definitely adds some flavours into a watch collection. 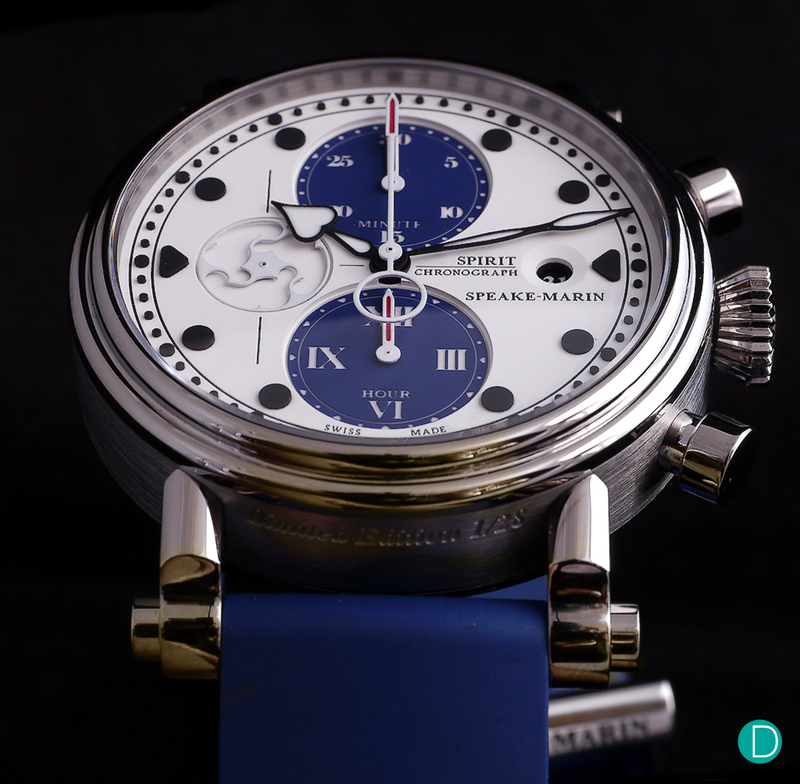 Arguably one of the more recognized names in independent watchmaking, Peter Speake-Marin has carved a niche in the watch collecting world with unique characteristics speaking to the namesake founder’s cultural and historical inspirations: From the distinctive Piccadilly Case to the emblematic topping tool motif, these are some of the details which are emblematic of Speake-Marin watches. First launched in 2014, the Spirit Seafire was notable for being the first chronograph timepiece produced by Speake-Marin. It found a home within the Spirit collection as Peter felt that a series inspired by vintage British military and pilot watches was the “perfect environment” for the classical chronograph. Over the last couple of years, Speake-Marin has produced numerous variants of the Spirit Seafire; Each of them featuring a black dial, accompanied with either red, blue, white, or orange detailing. For Baselworld 2016, Speake-Marin produced two special variants of the Spirit Seafire – the Blue & White Spirit Seafire. 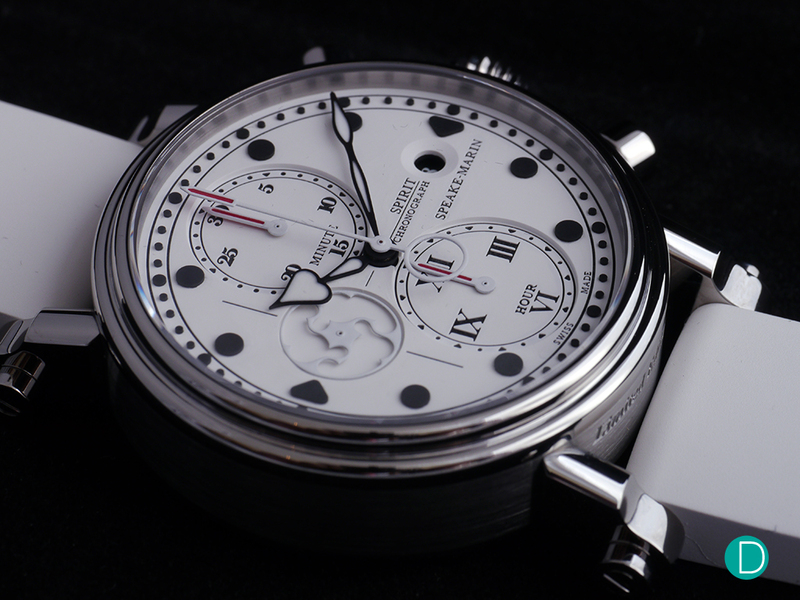 The Speake-Marin Spirit Seafire White. The contrast, at first glance, is pretty interesting. Like its brethren, the Spirit Seafire is fitted with Speake-Marin’s iconic Piccadilly Case. The stepped case with distinctive lugs gives the Spirit Seafire a classically elegant yet contemporary form, rendering it timeless much akin to an architectural structure that would stand the test of time. It’s as fresh today as it was when Peter Speake-Marin launched his inaugural collection in 2003. Similar to other Spirit Seafires, the 42mm case is made from titanium. The watch may wear slightly thicker (15mm) in order to accommodate the movement yet it remains comfortable on the wrist- The use of titanium substantially reduces the heft of this timepiece while downward tapering lugs allows the leather strap to conform to one’s wrist. Additionally, the right side of the watch is fitted with a fluted “diamond-shaped” crown, as well as pump pushers to operate the chronograph. 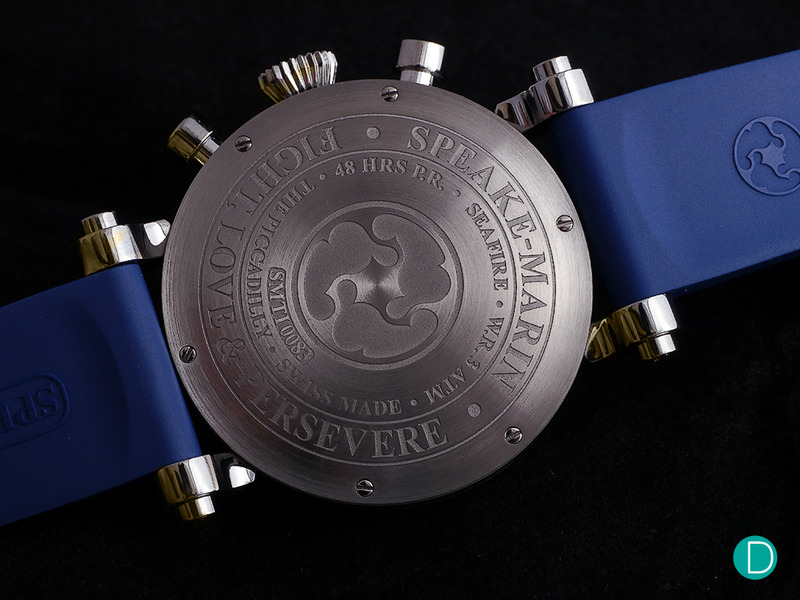 On the reverse, the brush-polished caseback features the topping tool motif, with the name “Speake-Marin” surrounding it. Interestingly, the caseback also features a short motto: “Fight. Love & Persevere”. Words to live by, more poignantly so when you consider they were conceived during the founder’s darkest days. The Blue Spirit Seafire. The contrast of the dial is excellent, which makes it very legible. The Blue & White Spirit Seafire, as its nomenclature suggests, comes in two different variants. 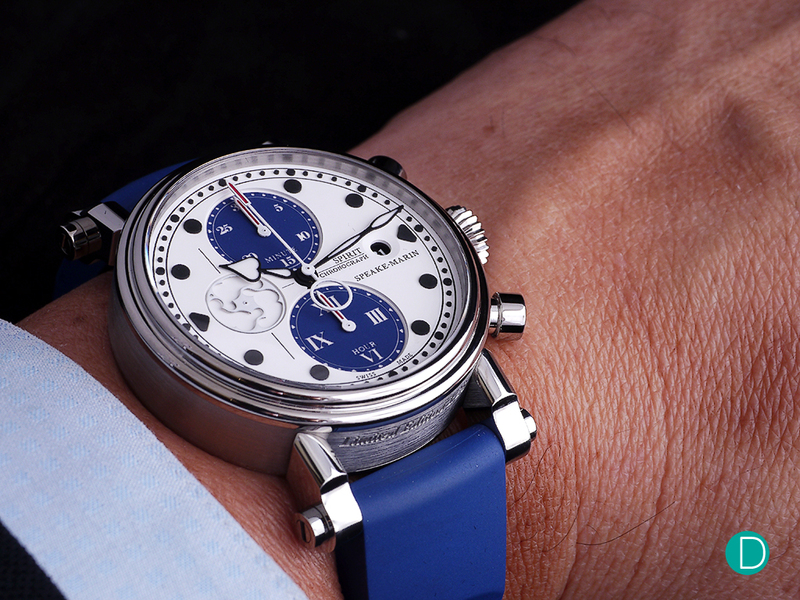 The first one features white dial, with a pair of blue sub-dials that is paired with white indices. The other, the White Spirit Seafire, comes with a pure white dial, with a pair of white sub-dials that features contrasting black indices. Naturally, both the Blue & White Spirit Seafire share some common traits with a few minute differences to distinguish each iteration. For instance, the indices on the main dial are finished in black. The same goes for the date indicator, in which the date wheel is black with contrasting white numerals. As for the topping tool motif at the 9 o’clock position, it is finished in white for both variants. The motif, notably, acts as a subsidiary seconds hand as well. Another noteworthy point would be the indices in the two sub-dials. For the observant readers, one would have realised that the minute and hour chronograph counters feature a different sets of indices. On one hand, the minute counter features the Arabic indices, while the hour counter comes with Roman numerals on the other hand. This is pretty intriguing, and it definitely makes the timepiece a little bit more conversational since Roman numerals are normally not found on chronograph counters. That said, the Roman fonts are a hat tip to the aesthetic codes of Speake-Marin. Another angle of the watch. The hands add an interesting touch to this timepiece. The watch is fitted with white “Foundation” style central hour and minute hands, filled with Super-Lumi Nova. As for the chronograph, they feature the “sword”-like hands, and they are finished in red. The central seconds hand for the chronograph lends levity to what could pass for a serious classic watch thanks to its counter-balance shaped in the form of a big ring. A close-up of the dial. The watch, notably, is powered by the solid Valjoux 7750 movement. The Spirit Seafire is powered by the Valjoux 7750, a robust workhorse automatic movement with 48 hour power reserve. The chronograph movement’s ubiquity is an advantage here as it’s one of the movements that many watchmakers are familiar with, thus servicing wouldn’t be much of an issue. The Blue Spirit Seafire on the wrist. The Spirit Seafire excites due to bold design cues, such as the use of Roman and Arabic numerals for its sub-dials and the “Foundation” style hands, to having high contrast black indices on white dial. It is not just a watch; it is a conversation piece. Between the two, we are leaning towards the Blue Spirit Seafire. Much like a midnight blue tuxedo, the blue variant is less anticipated than a black dial, nicely accenting the white dial. The watch is limited to 28 pieces each, and comes with either a rubber or leather strap. 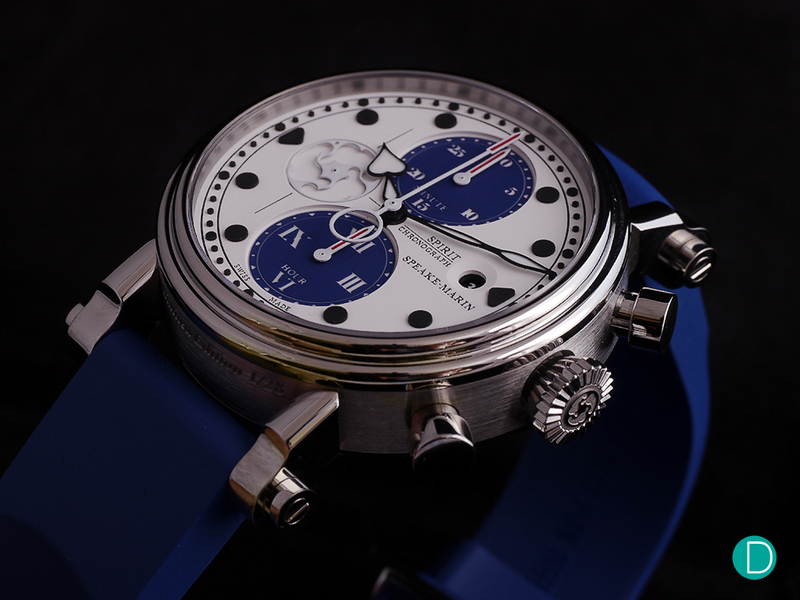 For more information, please check out Speake-Marin’s website here. White lacquered seconds disk “Topping Tool” Inspiration.